Over 185 million dollars. That is the amount of money Patagonia donated to nonprofit environmental groups and conservation efforts since the company was founded in 1973. Additionally, 38 million dollars have been invested in socially responsible companies and ventures. This doesn’t even begin to include countless volunteer hours and priceless results of their activism. Corporate social responsibility (CSR) has been built into their DNA since day one. What a bunch of granola eating hippies, right? As generous as this company is, there is no way that Patagonia is profiting! Actually, this could not be farther from the truth. The company has scaled to nearly $1 BILLION dollars and shows no signs of stopping. Let’s break down some of their social good marketing strategies and why they work. First and foremost, Patagonia’s CSR efforts are transparent. What good is transparency when it comes sales? It creates trust. 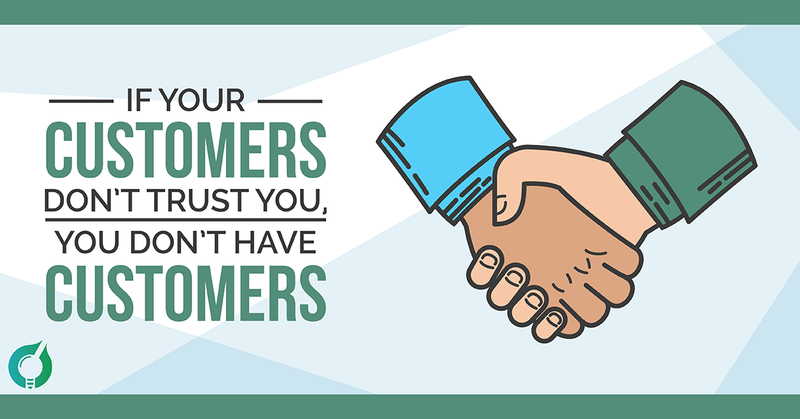 If your customers don’t trust you, you don’t have customers. Today’s consumer is well-educated with limitless investigative resources. If they detect that your company’s CSR isn’t all you’ve hyped it up to be, they will not only walk away from you, but they will also be sure to announce it to the world. It is easy to pinpoint Patagonia’s textile mills, factories, and farms, via their FootPrint Chronicles, an interactive map which gives a detailed description of each location. The company also publishes an Environmental and Social Initiative Report, as well as provides an online database which gives the breakdown of grants, campaigns, events, sustainability and fair trade efforts, materials selection, etc. This gives transparency to Patagonia, but also doubles as creative content and establishes them as an authority on corporate social responsibility; driving people to look at their business for answers. Patagonia has honed in on social media and grown a strong online community to deliver this content. They utilize hashtags, such as #ProtectBearsEars, to create awareness for their company, the activism that they are involved in, and ethics that they stand for. Rose Marcario, CEO and President of Patagonia, is even engaged in content creation. She writes articles on movements that she is passionate about. This is a brilliant way for their customers to emotionally connect at the highest level of the company. Telling Customers to Buy Less Drives Sales? Patagonia has developed their Common Threads Initiative, which promises that they will “make great stuff, fix it when it breaks, and recycle it when you’re done with it” free of charge. Patagonia asks for a pledge in return to “buy only what you need, repair it when it breaks, and recycle it when you’re through.” They started this initiative because they know that by keeping their clothing in use for 9 additional months that they can reduce their carbon, waste and water footprint by 20-30%. This seems counter intuitive, to ask your customers to buy less of your product, but Patagonia debunked that when they ran their “Don’t Buy This Jacket” campaign around Thanksgiving 2011. The ad prompted consumers to not buy their wares if they truly didn’t need them, then went on to discuss the environmental cost of producing these products. The next year, the company saw its revenue grow around 30%, and an additional 6% in 2013. Why did this work? It reinforces the fact that Patagonia stands behind it’s product and gives a sense of ease to their customers that if something breaks on their product it will be repaired. After they have received excellent customer service and gotten more usage out of the product, they can turn in their used clothing for credit, to buy more Patagonia product! the goal is to do business with people who believe what you believe”. These strategies work because people are willing to pay for a high-quality product that aligns with their values, resulting in an engaged loyal community and repeat buyers. When people rally behind what you sincerely believe in, you can’t fail. How are you communicating the values you believe in? For more corporate social responsibility marketing strategies check out this ChuckJoe blog post, 11 Awesome Social Good Marketing Strategies! Social good marketing is fast becoming a driving force behind some of the most successful advertising initiatives. Just as there are thousands of ways to bake a cake, there are many methods to communicate your positive social impact to conscious consumers. Social good marketing is an amazing way to align your brand with a purpose and inspire consumers to share your story. People are more receptive to messaging that touches upon something they feel passionate about than promotional advertisements or new product launches. The world’s most innovative business leaders are using their marketing budgets to make positive impact leading to consumer advocacy and boosted profits. The mobile gaming industry is rapidly expanding and grew over 21 percent from 2015 to 2016 while generating nearly $37 billion in revenue. Games are a wonderful way to keep people entertained, increase consumer participation in purposeful giving, and highlight your brand’s good work. An example of a social good gaming campaign is Save the Park. American Express partnered with Games for Change and the National Park Service to develop this game that gives players a glimpse at what it’s like to be a park ranger and learn key facts about America’s protected lands. Amex donated $1 for every download up to $50,000 effectively promoting their services, increasing consumer engagement and supporting a good cause. Nothing pulls at the heartstrings like a well told story about how your brand is improving real people’s lives. Vitamix partnered with SoulPancake to facilitate special meetings between chefs who wanted to thank someone important to them with a home cooked meal. This video tells the story of how chef Nick Liberato was put out of a job and shown tough love by a former employer who effectively gave Nick the motivation he needed to launch a successful career and live his dream. After not seeing each other for years, these two old friends are united around a meal Nick made with Vitamix’s blender. This is a great example of how to feature your product or service in a larger context of creating a positive social impact. Social media offers an direct way to inspire consumer activism while scaling organic reach of your messaging and social impact. 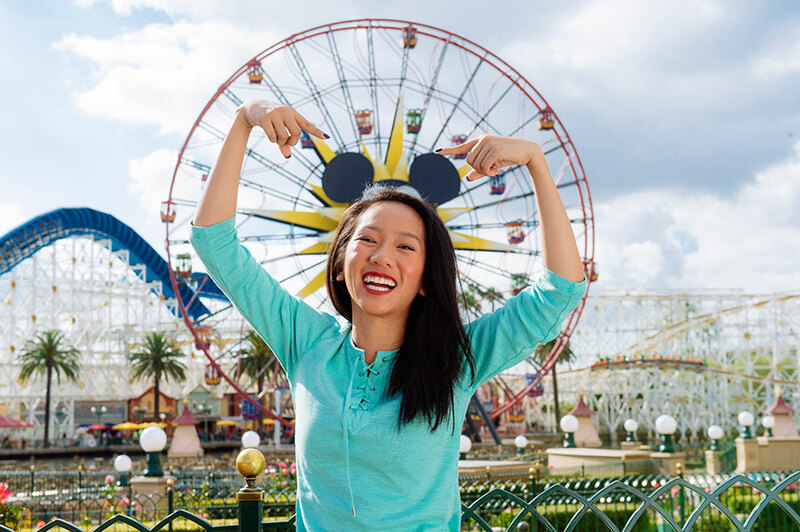 A great hashtag for good strategy was Disney Parks’ #ShareYourEars Social Media Campaign. Disney donated $5 to the Make a Wish Foundation for every photo posted with their #ShareYourEars photo frame and hashtag. With the help of consumers, they were able to donate $2 million from January 29th to March 14th, 2016. People want to feel good about what they’re buying and selfish altruism is a powerful marketing strategy that brands can use to make consumers feel like they are doing their part to make the planet better. While BOGO strategies have been criticized for overlooking root problems, they are an emotionally compelling way to engage consumers. A good example of a buy one give one strategy is Warby Parker’s glasses initiative. The company donates a pair of glasses to someone in need for each pair sold. They also fund eye care training and awareness campaigns in developing countries. A terrific way to participate in a purpose-driven movement while simultaneously strengthening internal community and generating earned media is to sponsor employees to get involved in meaningful work outside of your company. Deloitte offers employees up to 48 paid volunteer hours in which they can use their skills to better the world. Not only does paid volunteerism make employees feel connected to the company and good about the work they do, it also creates powerful branding stories and improves public image. There’s a growing number of companies who’ve joined the 1% for the planet initiative, which connects corporate do gooders with environmental causes. This is a great way to join a global community, give back and tap into storytelling ideas for marketing strategies. While one percent is great, donating higher percentages scales your impact and can boost the effectiveness of your social good campaigns. 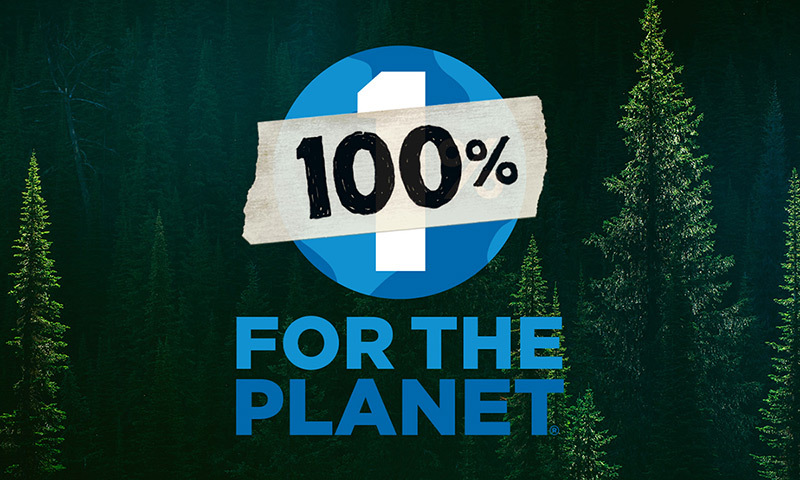 Patagonia, which always gives 1 percent to the planet, donated 100 percent of 2016 Black Friday sales and the results were a welcome surprise. The outdoor retailer sold a record $10 million that day, all of which they contributed to non-profit partners. Additionally, they received a ton of positive media coverage and truly inspired consumers to feel like they were purchasing for purpose. Teams offer fun storytelling potential. There are always trials and triumphs that make rooting for a team exciting to follow, which can be a great way to increase consumer engagement. If you can couple this with a meaningful social contribution you are truly winning. Novo Nordisk does an awesome job of promoting a good cause and increasing brand awareness by sponsoring a professional team of triathletes with Diabetes. This social good marketing strategy is especially powerful because all of the team members use and benefit from Novo Nordisk’s healthcare products. An awesome way to incentivize people to use your app is to provide a charitable donation for every time a specific action is taken. That said, the app should also provide users with value or entertainment. Charity Miles does a great job of inspiring consumer engagement by donating money every time someone runs, bikes or walks while tracking their miles in the app. They generate income through sponsored advertisements users see each time they open the exercise program. Video streaming is an immensely popular internet pastime. Nearly 5 billion videos are viewed every day on YouTube alone. Imagine all the social impact that could happen if every one of those views provided a small contribution to better society. CATv’s ran a social good marketing campaign to inspire viewership and spark an emotional connection among the audience by donating money every time someone watches a cat video on their platform. Now that’s purrrrrpose! A classic way to support social good is to host an event for a cause. 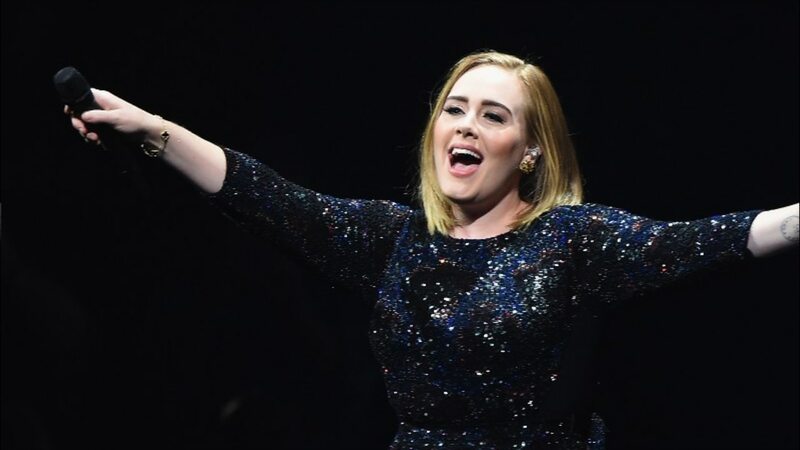 Singer Adele took this further by giving concert tickets to people who donated $20 or more to Sands charity for a UK performance. Your advertisements will be much more memorable if you provide people with value when they interact with your messaging. 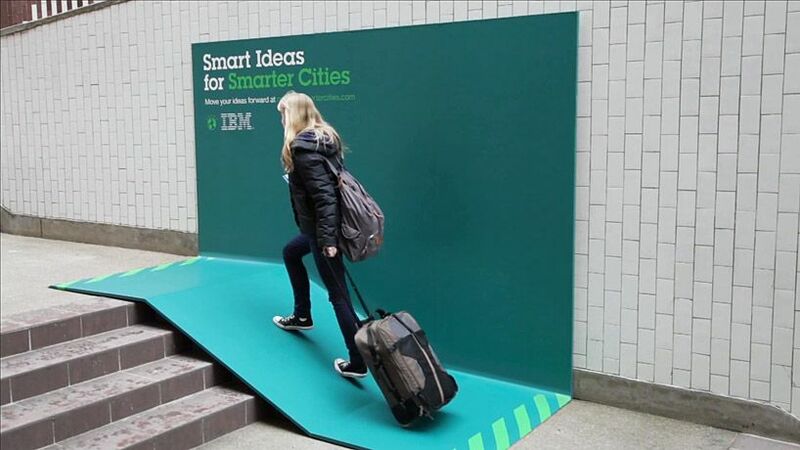 IBM took this one literally when they made billboards that serve as handicap ramps, rain shelters, benches and more. Social good marketing campaigns are a creative and profitable way to scale your marketing efforts and create a positive impact in the world. Whether you engage consumers with an addictive and purposeful app, share a touching story about an experience your brand facilitated, or promote participation through a hashtag, purpose-driven marketing is a powerful way to deepen connections with your target audience. Additionally, it’s an excellent means to increase the organic reach of your communications strategies and join movements bigger than your business or sector. 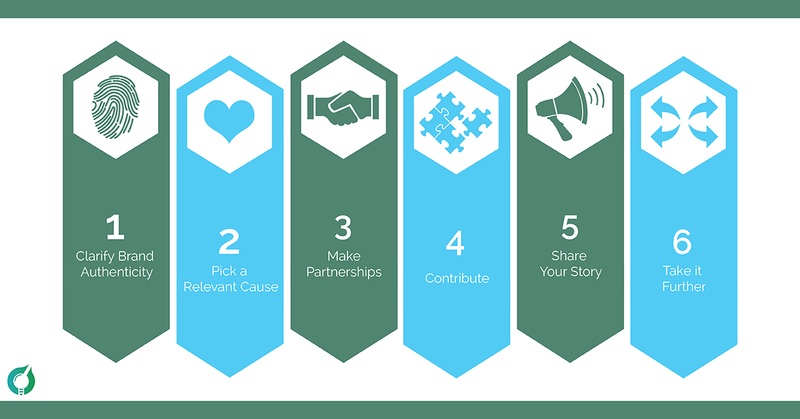 If you’re looking for more inspiration check out this post on 6 steps to get started with cause marketing and please share any questions or comments you have below. You may have heard of a social good company like Toms, which gives a pair of shoes to someone in need for every one purchased, but cause marketing is more than a trend for optimistic entrepreneurs. Some of the world’s biggest brands like Coca Cola, Unilever, and Walmart are investing in purposeful initiatives that give back to the planet as well as their bottom lines. So, What is Cause Marketing Exactly? Cause marketing is the corporate practice of aligning with a good cause and promoting that activity to increase consumer interest, engagement and purchases. Corporate good-doing goes back centuries; however, cause marketing was officially coined in the 1980’s when American Express helped restore the Statue of Liberty and Carol Cone launched a walking campaign for Rockport Shoe Company that mobilized the brand to scale from a small business into a national staple. Over the years, cause marketing has grown from an adolescent into an adult and so has the nomenclature. Some experts criticize cause marketing campaigns for leveraging good deeds as a public relations stunt rather than a means to drive authentic social transformation. In response, many purposeful business leaders now use metrics and benchmarks to quantify and scale initiatives that create real social change and the term “corporate purpose” has prevailed to reference measurable social impact in the private sector. In recent years, the widespread use of the internet and social media have increased transparency and consumer activism. People around the world now actively influence brand storytelling and share their support for corporations contributing to social good, while they simultaneously blast those that aren’t doing their part. What’s more, our planet faces unprecedented social and environmental crisis that require more resources than governments and nonprofits can provide. Today’s corporate leaders are stepping up to the plate to catalyze social transformation while simultaneously growing consumer advocacy and profits. A recent global study of nearly 10,000 consumers showed that 91 percent of people expect companies to do more than make money by practicing socially and environmentally responsible business. 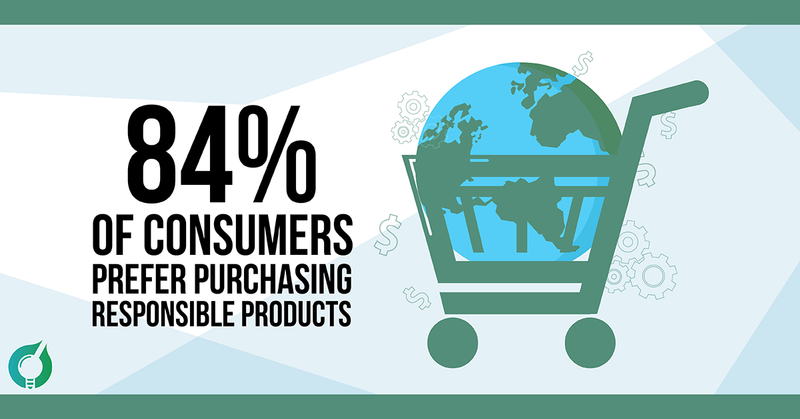 Additionally, 84 percent said they prefer purchasing responsible products and 90 percent would boycott a brand for irresponsible behavior. Millennials and generation Z – the future motor of global capitalism – are particularly conscious of corporate behavior. Another survey (paywall) found that 82 percent of millennials and generation Z actively purchase from brands that contribute to causes they care about and 82 percent said they feel better about spending when they buy products or services from a company invested in social good. An awesome example of a brand using purposeful cause marketing strategies to scale profits is Unilever. The global conglomerate, which owns hundreds of consumer goods brands, recently disclosed that its portfolio companies practicing and promoting social and environmental good – like Dove and Ben and Jerry’s – grew 30 percent faster than those that don’t. Additionally, those purposeful brands carried almost half of Unilever’s expansion in 2015. In today’s digitally connected, socially conscious world It’s clear that purpose powers profits and companies that practice what they preach will receive consumer support and purchases. Before you get started with your own purpose-driven cause marketing campaign be sure to identify and articulate your authentic brand values. 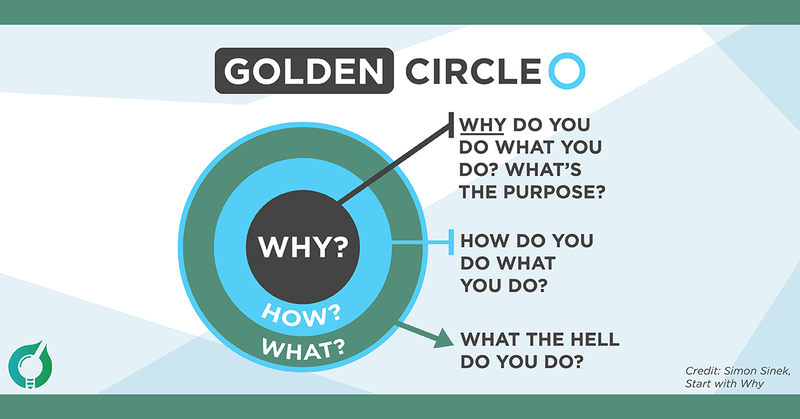 In other words, think about what your brand stands for, what your target audience cares about, why a certain cause or movement is particularly important to your company and how you can fit into the broader ecosystem of social change. Once you’ve clarified what your brand stands for and how it fits into the web of global good-doing start honing in on a specific issue. This can be overwhelming because there are so many good causes in the world and so many people and places that need help. While you can eventually expand your social good campaigns to include multiple projects, it’s important to start with a single project that displays clarity and direction. An excellent way to narrow down options is to identify a problem that resonates with your brand and community. Now that you’ve picked your cause, do some research on how other organizations are addressing the problem you want to fix. In this stage it’s important to select several potential partner organizations because everyone you want to partner with may not want to partner with you. If you’re working with a non-profit organization be sensitive to how they represent themselves. It may go against their internal culture to blatantly promote your sponsorship on their website or social media channels. Be flexible to branding strategy and partnership specifics. This will help you establish long-lasting mutually beneficial relationships. Just as there are many roads to Rome, there are many ways to give. A few ways that other brands contribute is by donating a percentage of sales to a good cause, giving a product away for every product sold and sponsoring an event that has a social impact. If you’re looking for strategy inspiration check out this post on 11 awesome social good marketing campaigns. Contributing to meaningful work is important for our planet but in terms of your bottom line it’s crucial to share your social good campaign with a relatable and compelling story. While consumers are indeed demanding corporate social responsibility, good deeds go unnoticed without effective cause marketing and your efforts could provide no return on investment. For this reason, it’s super important that you find a way to tell an emotionally riveting tale about the amazing work your company supports. Be sure to focus on how your work impacts an individual person rather than citing grandiose facts and global trends. Make it short and sweet. And provide viewers with an inside view into how their purchase is solving an important issue affecting our planet. Way to go! If you’ve gotten this far you’re well on your way to using your business to create a positive social impact while strengthening consumer devotion and scaling profits. If you want to take your cause marketing campaigns even further, couple growth with impact. You can do this by building equitable and sustainable supply chains, strengthening employee community involvement and investing a portion of your profits in social good. Consumers want companies to do good deeds, not just offer good products and services. In today’s globally connected and technologically attuned world people are eager to support brands making a positive impact. At the same time, consumers are ready to boycott companies that aren’t doing their part. And that’s especially true for millennials and generation Z who will inherit the problems of the world and drive future financial growth. People are often overwhelmed with advertisements on the internet, social media, television and in print. To capture consumer attention, support and purchases, companies must build an emotional connection with their customers that goes beyond selling stuff and inspires the feeling of being part of a global community working to make the world a better place. Although technology and social media are rapidly changing, compelling storytelling and the need for a better planet are here to stay and so is cause marketing. How do your favorite brands share their social good work?